Testing a Voltage Before Touching Could Save Your Life! Most of our discussion will be pertaining to low voltage systems (600 Volts or lower). However many principles used for testing low voltage systems (LVS) are often used when testing medium voltage systems (MVS) as well with a few minor adjustments. This is a photograph of a typical one starter. Now put this into example: The one starter appears to be off and de-energized. Nothing seems to moving and it seems safe to begin working on, but how would you verify that the starter is off and stable to work on? Here are a few key TBT Principles. Test Circuit again if job continuity is broken. 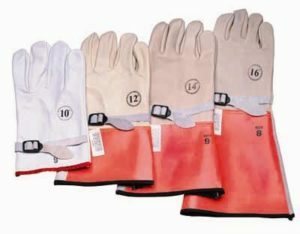 In the NFPA 70E :Table 3-3.9.1 Document, it describes various hazard risk categories in classifications also stating that Voltage Rated Gloves are REQUIRED for all voltage testing above 50 Volts. Proper Arc Flash PPE is also required when testing any high power energy circuit. Be sure to confirm this by referencing the minimum PPE requirements as well as additional flame clothing requirements according to your site charts hosted in the ECR. 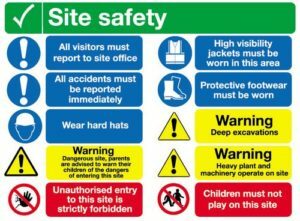 The 2005 NEC Handbook required that high energy warning labels be placed on the switch gear. 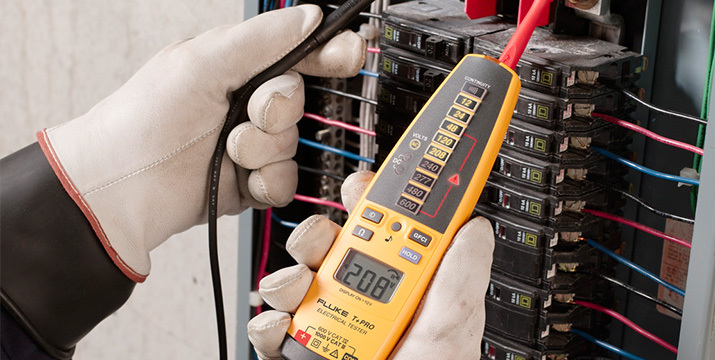 A meter must always be tested before and after making an absence of voltage check. The voltage source must be the same type. 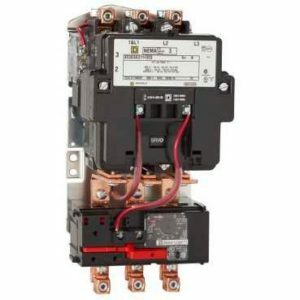 For example, if you are testing an AC Circuit, you should test the meter with an AC Source. 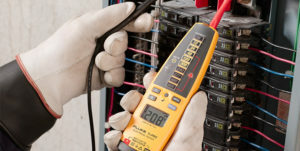 The proper handling of the test meter is more critical when testing inside a congested panel. Always contact ground or neutral first with the black lead, and place the red lead in the meter. This allows the reach of the probe to keep extended while keeping the hand further away from a potentially energized source. Once a piece of equipment, such as a starter, has been properly de-energized and locked out, visibly check the knife blades. Verify that they are physically disconnected before any test are made. Then A to B, A to C, and B to C on the top fuse clips and then again on the bottom. If the equipment that was just de-energized still shows voltage, the first thing you need to is make sure you are on the correct circuit. You can do this by checking your circuit prints and labels. Once the circuit is verified, you should determine if the voltage is induced by checking it with a low input impedance meter which should collapse induced voltage to zero. If there is still voltage present, check the circuit for any possible back-feed or equipment failure. Let’s say for example the High Z Digital Meter Reading is 95V, the Analog Meter Reading is 80V, and the Low Z Digital Meter Reading is zero volts. The values given are intended to be examples and are not meant to indicate what the value of the induced voltage will be in every case considering they vary. The Analog meter usually has a lower impedance reading than the digital meter, while a low impedance meter will normally low the circuit and ultimately reduce the voltage to zero. A proximity tester should be used for a first test if a circuit is insulated or taped. Because of the tester’s limitations on low voltages, it should not be depended on as the only test done. If no voltage is indicated, wearing the proper PPE, expose the conductor for testing. Verify zero volts with the contact meter. If voltage is indicated with the proximity tester, verify proper circuit is locked out. If voltage is present, load circuit at switch with a low impedance meter and re-check insulated conductor. This test may require more than one person, or the meter may need to be attached to the circuit. The proximity tester will indicate induced voltage on insulated conductor, but does not indicate voltage due to circuit loading by low impedance meter. Unlike low voltages, the proximity tester design for medium voltages is a good choice as a test before touch meter in most situations. This is due to the fact that medium voltage circuits provide a strong electric field for testing. As a result, checking ground to phase and phase to phase with a contact meter is often unnecessary. 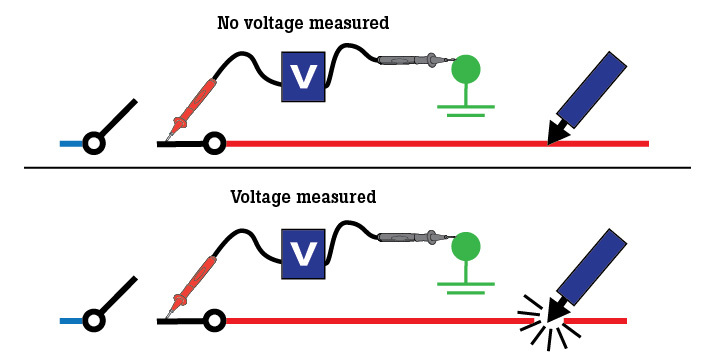 A common mistake is trying to use a proximity tester to indicate voltage on a shielded conductor. 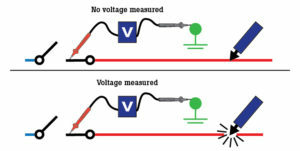 On shielded conductors, away from terminal connections, a spiking tool is the only device that can indicate that the conductor is de-energized. In this 6900V, Three Phase Circuit, there is no bare metal surface to use a contact tester. Remember that the Test Before Touch process is not always simple. Be sure to test every circuit and every conductor before you touch. It could save your life!